The majority of this series comes from fieldwork, vertical files, and administrative files related to the Okefenokee Traditional Music Survey, a fieldwork project funded by the Lila Wallace Reader's Digest Community Folklife Program from 1998-2000. The project documented a distinctive folk region by updating the pioneering work (1912-51) of naturalist and amateur folklore collector, Francis Harper. 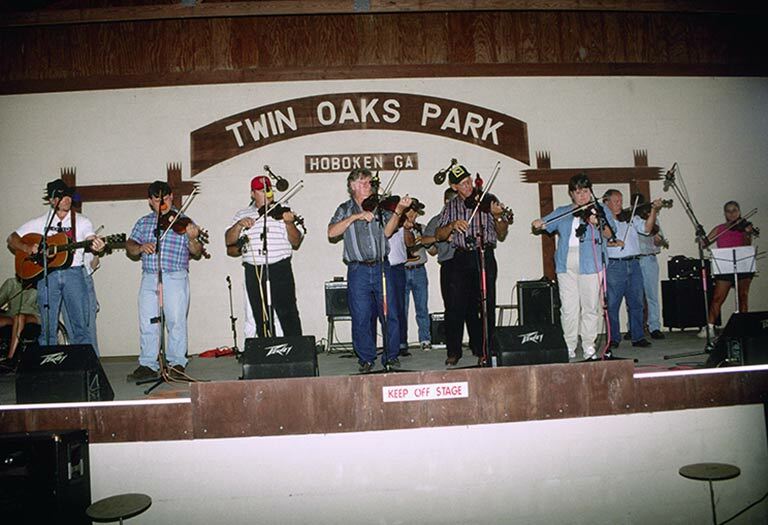 The Okefenokee Swamp environs is one of Georgia's distinctive folk regions, shaped by Celtic ethnicity, geographic isolation, and Primitive Baptist religion. The swamp itself occupies more than 600 square miles of southeast Georgia and northwest Florida. Indian peoples occupied the "Land of the Trembling Earth" through the early 1800s , when most were driven out or forcibly removed by Europeans. 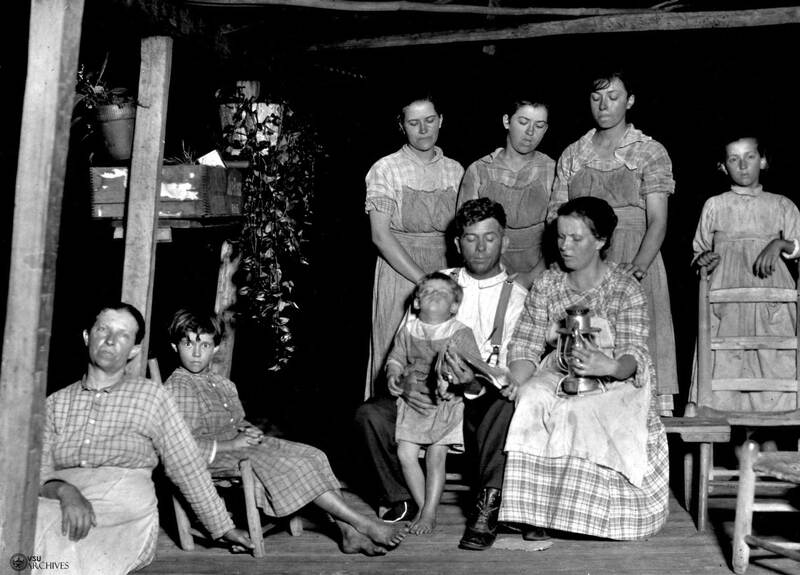 From the early nineteenth century through the mid-twentieth, the swamp housed an independent, self-sufficient community of "Crackers," most of Scotch and Scotch-Irish origin via North Carolina, who scratched out a living through livestock herding, subsistence agriculture, and naval stores. 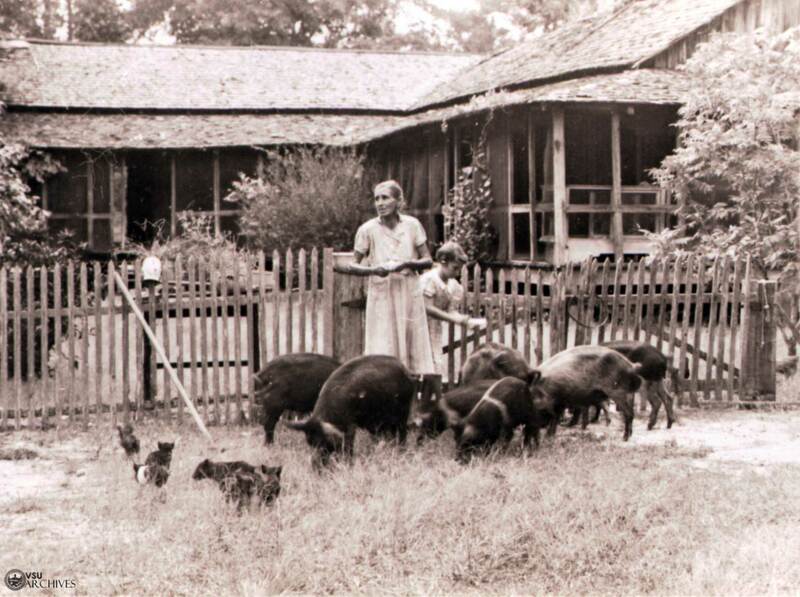 Rhoda Mizell Spaulding feeding a litter of pigs at Suwannee Lake, early 20th century. Spaulding sang many old ballads for collector Francis Harper. Photo by Francis Harper courtesy of Delma Presley. 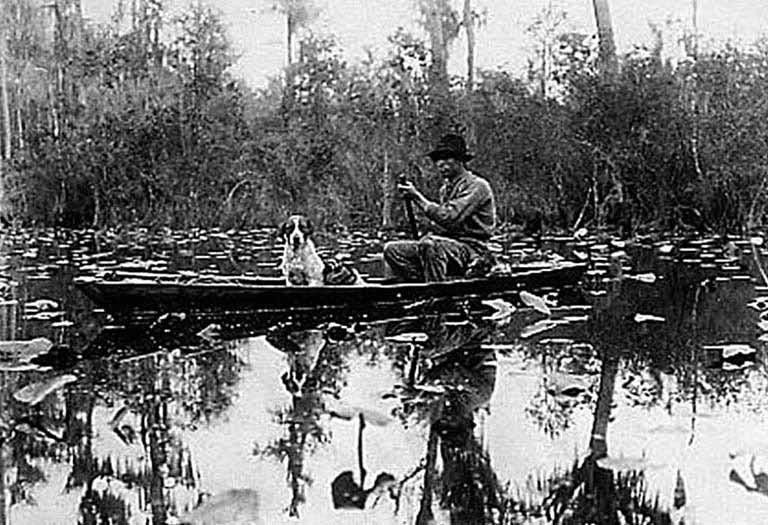 For much of its earlier history, the Okefenokee swamp was a refuge for Indian peoples, escaped slaves, Civil War deserters, and others seeking concealment. Various traditional narratives deal with these kinds of topics, including accounts by present-day descendents of Indian peoples who fled to Fort Moniac on the St. Mary's River during the Indian Removals. 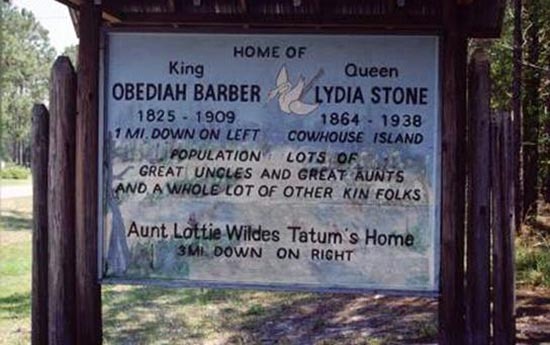 In contrast to the widespread view that "there are no Indians in Georgia," family folklore among these descendents suggests that some Indian people stayed in the Okefenokee area, hiding their heritage and intermarrying with early European American settlers. 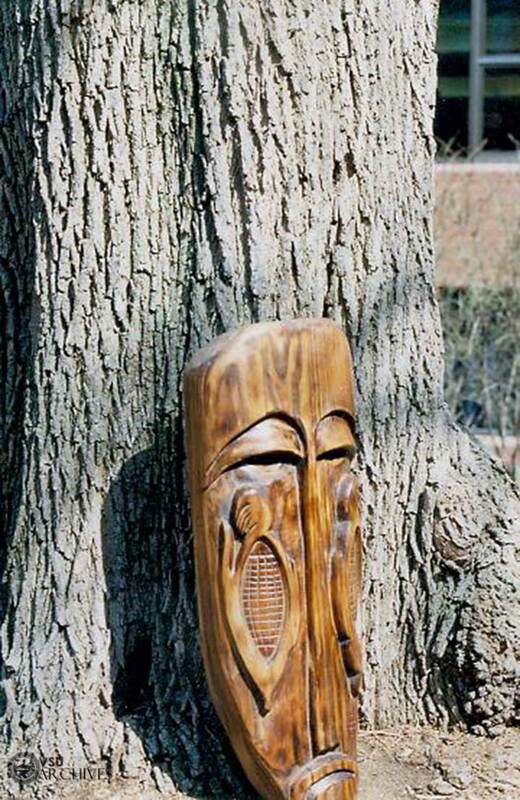 Bobby Johns "Bearheart" of Pensacola, was raised in a Creek/Scots family in South Georgia, where he learned woodcarving from his clan uncle, represented in the cypress knee carving shown here. Photo by Laurie Kay Sommers, 2005. 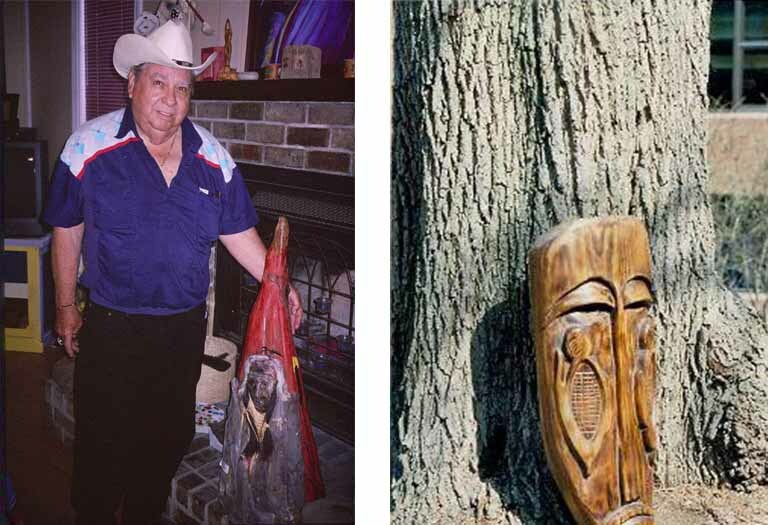 His elder brother, Joseph "Cayoni", mentored with the brothers' grandfather, a cream_bg-known South Georgia carver, from whom he learned to make the eight traditional carvings that were used for ceremonial purposes by the Creek people of the Altamaha River and Okefenokee areas.Pictured right is Joseph Johns' carving of a Creek wedding mask; the corn design represents hope of progress and happiness. Contributed photo, used with permission. During the 1800s, this region had among the smallest African American populations in the state. 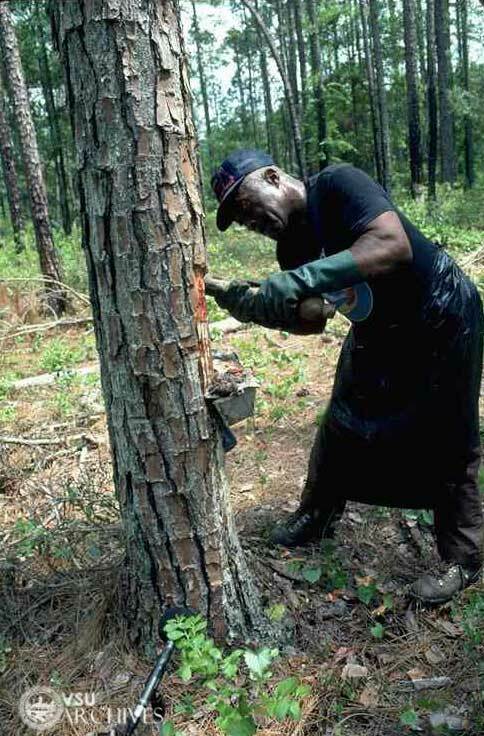 After the Civil War more blacks were drawn to the interior of southeast Georgia by jobs in farming, turpentining, logging, and the railroad. Oral accounts describe the worksongs of gandy dancers (or crews of black railroad track layers),sacred music of black churches, and the juke joints and blues of the black turpentine camps. Of these only the sacred music traditions continue in the region today. 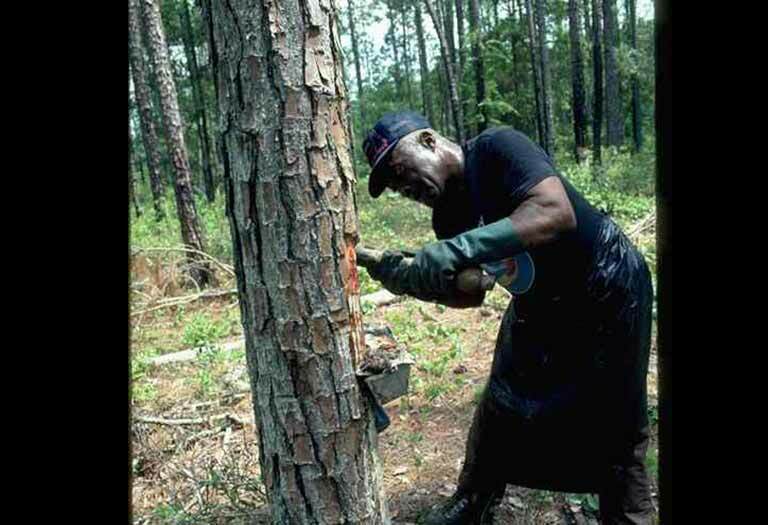 Elliott West of Folkston, was one of the last turpentiners to work the woods around the Okefenokee. White, black, and American Indian crews all worked the woods in this region. Photo by Laurie Kay Sommers, 1998. 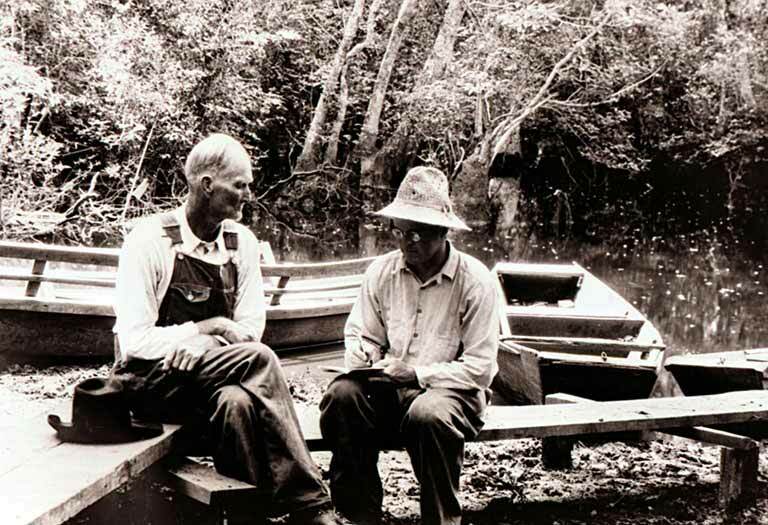 From 1912-1951, naturalist and folklore collector Francis Harper documented swamper folklore--that is, traditions of European Americans living in and around the Okefenokee--including the region's distinctive folk speech, tales, music, customs, home remedies, and beliefs. 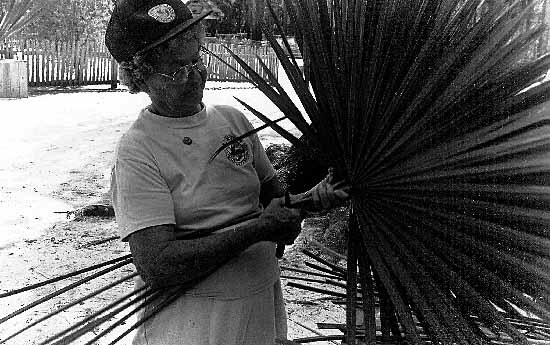 Harper's work with the Okefinokee folk was completed by his widow, Jean, and folklorist Delma Presley with the 1981 publication of Okefinokee Album. 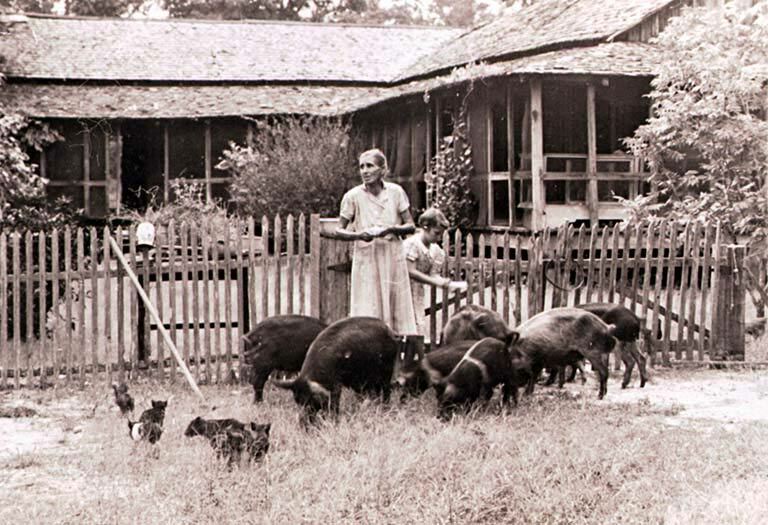 The Harpers were instrumental in the establishment of the Okefenokee National Wildlife Refuge in 1937, which ironically marked the end of the historic period of Okefenokee folklore Harper worked so hard to record. 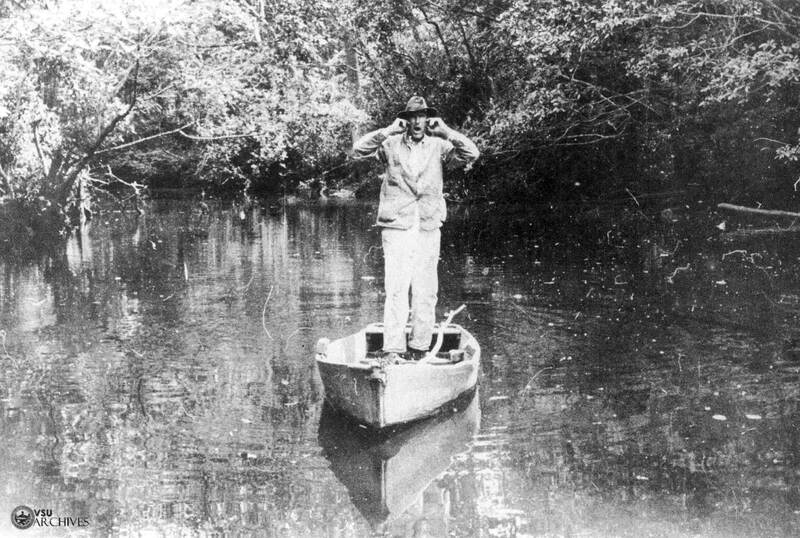 Francis Harper transcribes stories told by Lone Thrift, Suwannee Lake, 1930. 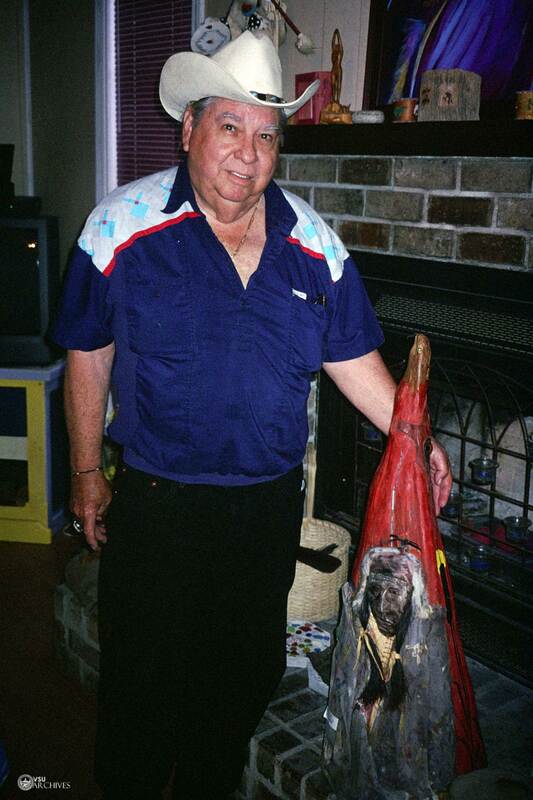 Although there are no longer people living in the swamp, many Okefenokee folk traditions continue in nearby communities. Fishermen and hunters, for example, served up 'duck rice' and fried fish at camps, and reminisce about the days of gator hunting and frog gigging in what is now a federal wildlife refuge. Special poled boats, suited to maneuvering in tight water, continue to be made by a few individuals. 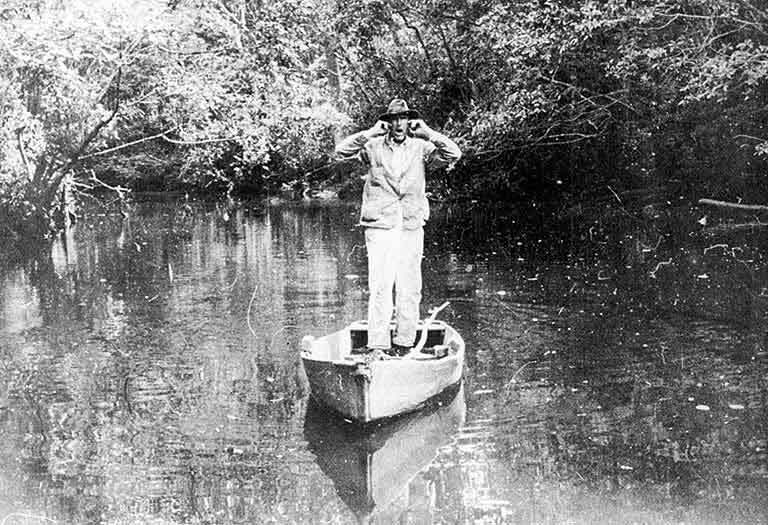 Okefenokee otter hunter in traditional watercraft, December 1916. 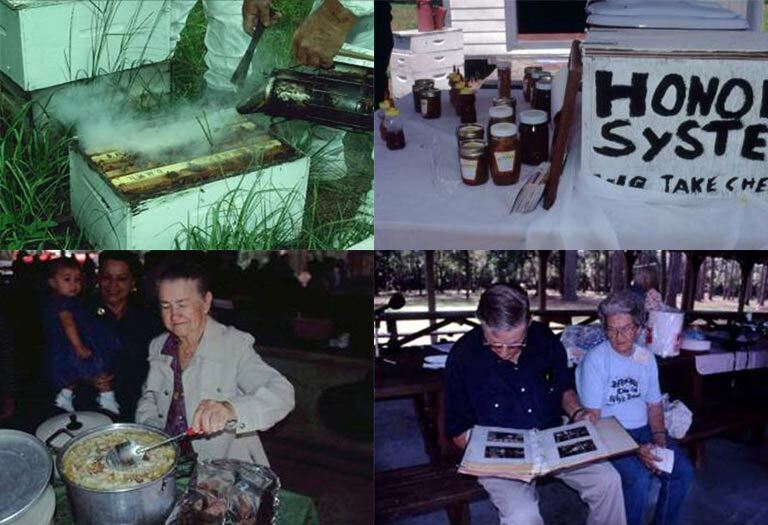 Okefenokee families for years have taken advantage of the mild climate and large expanse of "honey plants" such as gallberry and tupelo gum to keep bees for honey.The counties surrounding the Okefenokee are now home to the state's largest commercial honey operations. 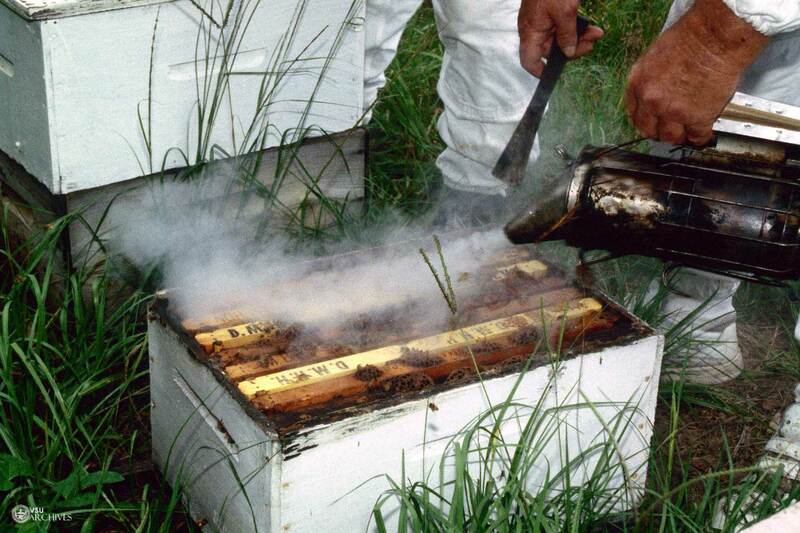 Beekeepers usually apprentice with other beekeepers, developing a keen knowledge of the woods, the habits of bees, and the rhythm of the seasons. The distinctive ecosystem of the great swamp is the subject of legends, tall tales, and personal experience narratives about bears, gators, and other encounters with the natural world. 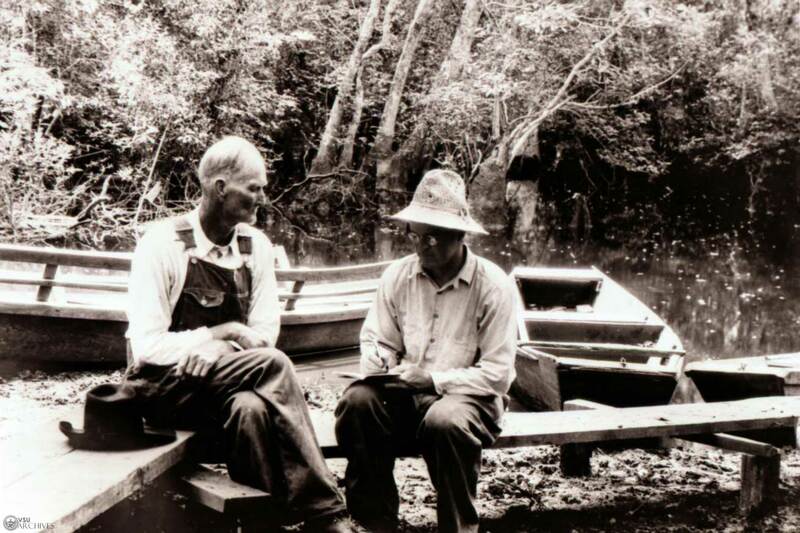 Georgia's best-known traditional storyteller was fishing guide, Lem Griffis. Griffis, who died in 1968, entertained visitors to his fish camp outside Fargo with well-honed whoppers, such as this description of "Odd Insects" collected by Kay Cothran: "See that honey a-sittin' up there on the shelf? Well, I crossed my bees with lightnin' bugs so they could see how t' work at night, an' they make a double crop o' honey every year." Stories about hunting and fishing, colorful characters of the past, and memories of growing up on one of the "islands" in the Okefenokee, still abound in the region. 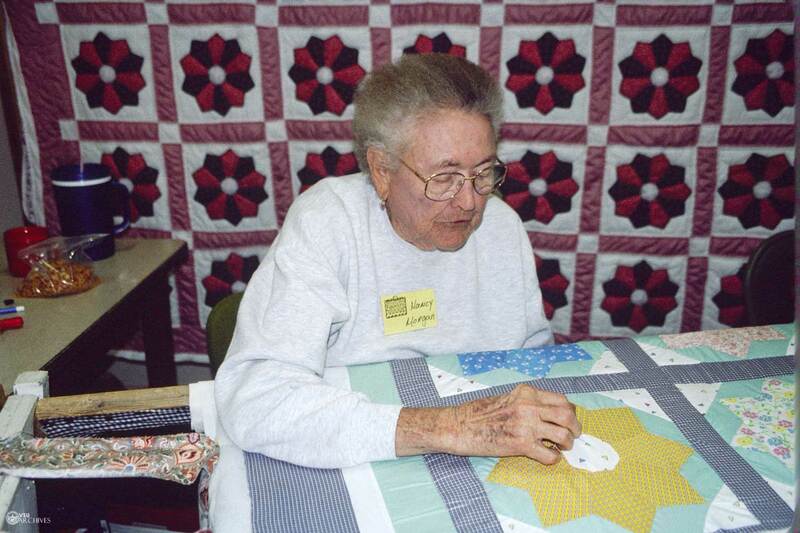 In recent years, persons whose families had connections to Billys Island, for example, gather for an annual potluck and exchange of memories at the Stephen Foster State Park outside Fargo. 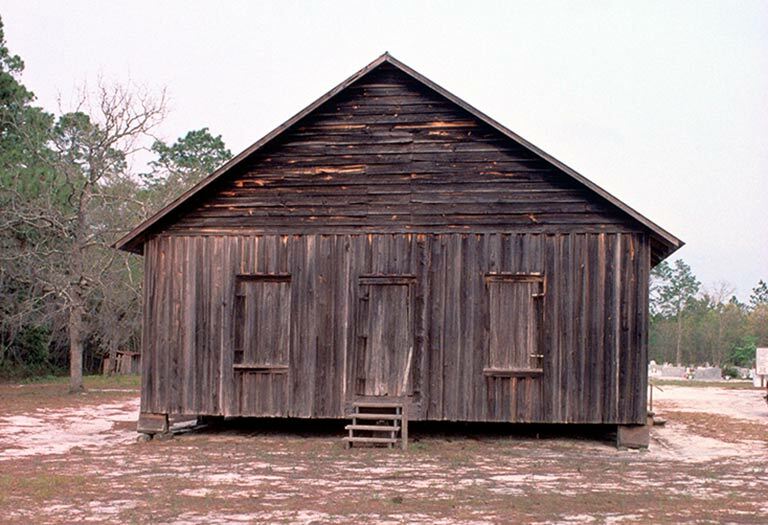 The Chesser Homestead on Chessers Island (outside Folkston), and other historic sites such as Trader's Hill (Folkston) or Obediah's Okefenok (Waycross), are focal points for family reunions and special community events. 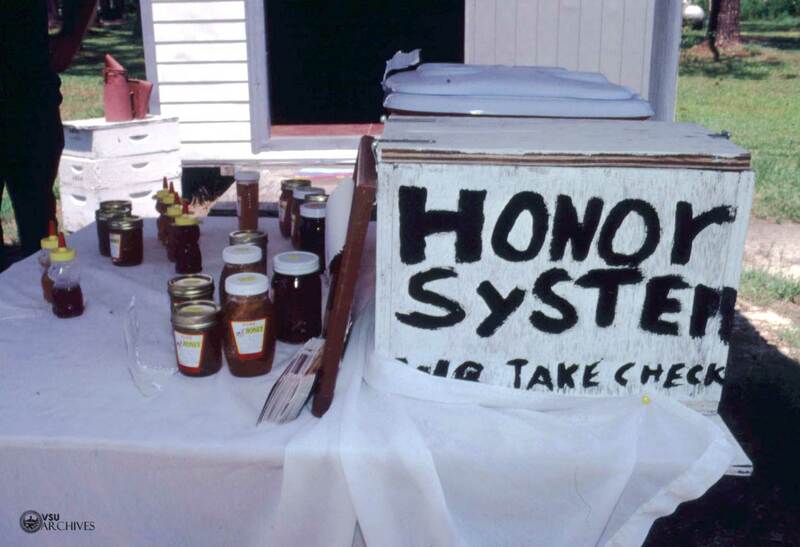 Top: Walter and Dicie Henderson of Manor are among many beekeepers in the Okefenokee environs. 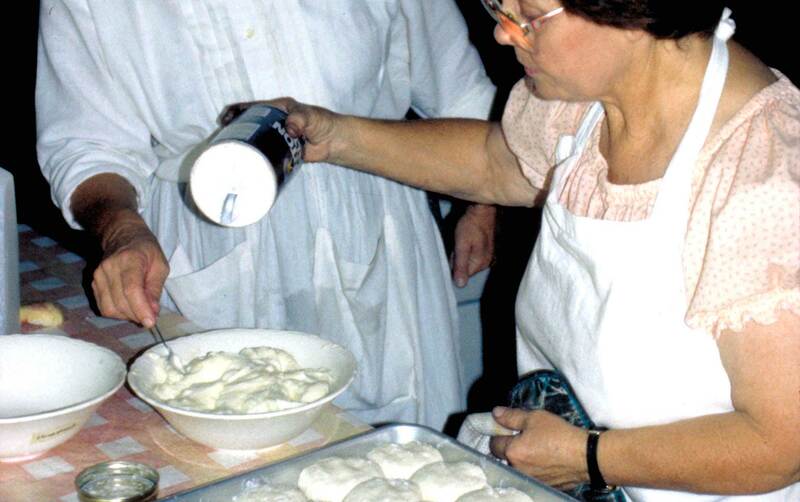 Bottom-left: Roxie Chesser Crawford makes chicken and dumplings at the Chesser Reunion, Trader's Hill, 1999. 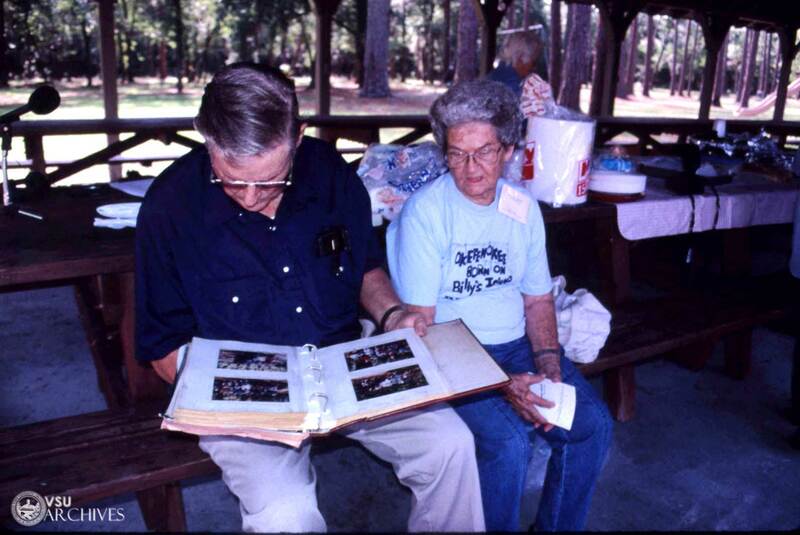 Bottom-right: Eugene Velie and Bernice Roddenberry share memories at the Billys Island Reunion, Stephen Foster State Park, Fargo, 1999. Photos by Laurie Kay Sommers, 2000. 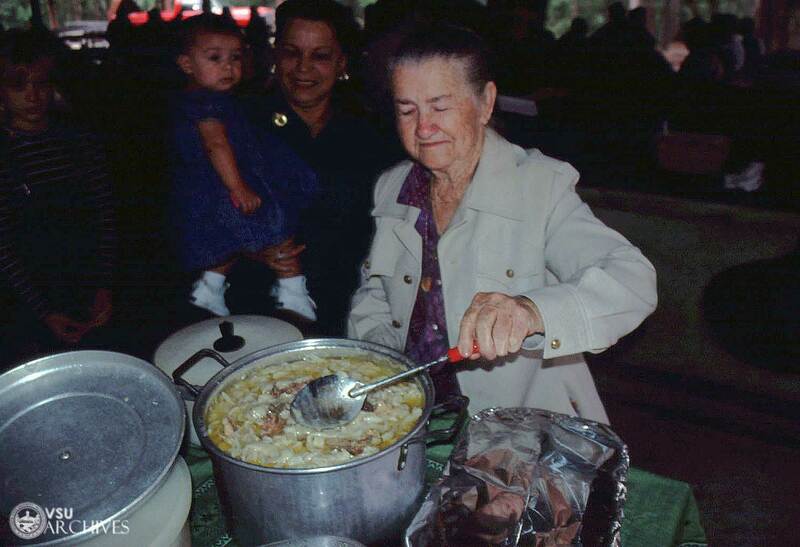 At the an annual Chesser Open House, for example, Chesser family descendents and neighbors gather to talk, eat a simple meal cooked on the homestead's wood burning stove, and share with visitors customs associated with life on Chessers Island. Some demonstrations, such as lye soap making and washing clothes with a "battlin' stick," are nostalgic re-creations of past lifestyles. Others, such as quilting, palmetto broom making, turpentining, and sacred harp singing, still are practiced in the surrounding area. 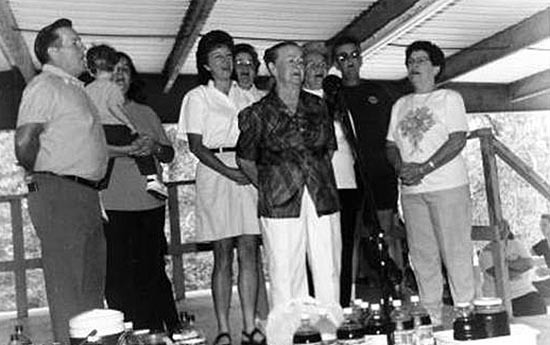 Roxie Chesser Crawford, family matriarch, leads the traditional shapenote singing of Amazing Grace, Chesser Reunion, Trader's Hill, 1999. Photo by Laurie Kay Sommers. 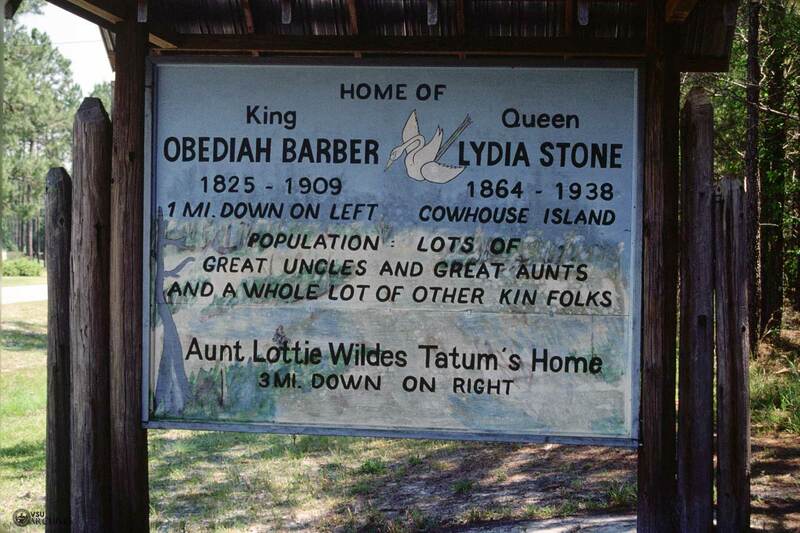 Sign for Obediah's Okefenok on Swamp Road south of Waycross. 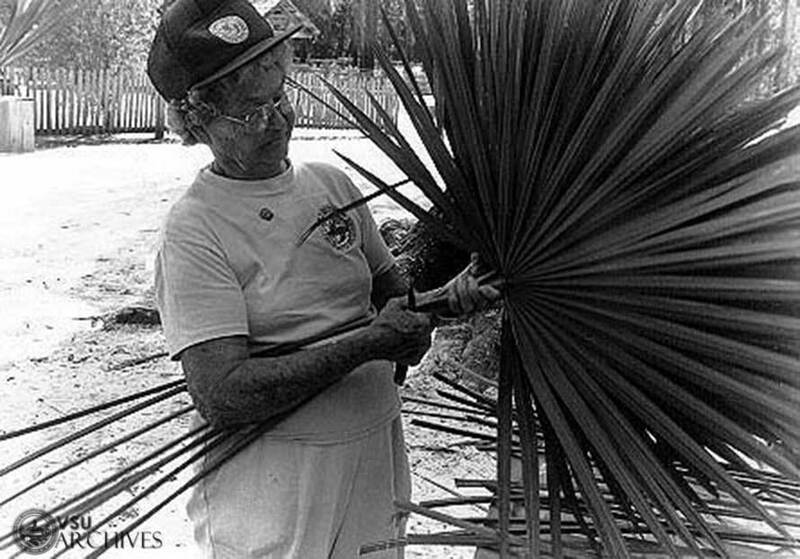 Bernice Chesser Roddenberry begins to make a palmetto broom for sale at the annual Chesser Homestead Open House, 1977. 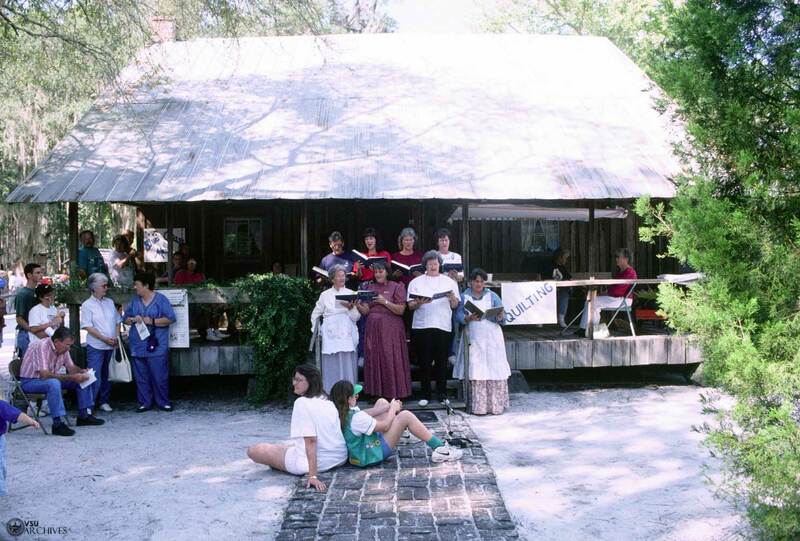 Sacred harp sings' date to at least the 1860s in the Okefenokee. The sacred harp or "shape-note" tradition originated during the colonial period as a means to teach congregations to sing. 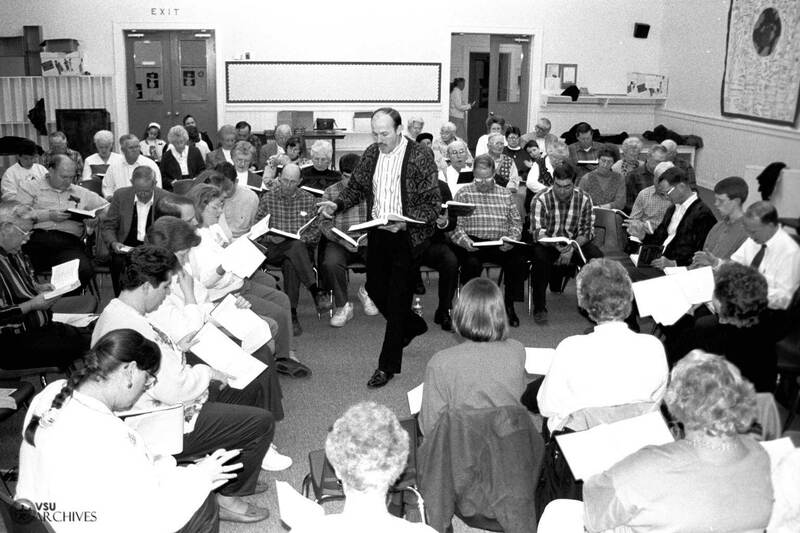 Traveling singing school teachers used "four shape" tunebooks with religious lyrics in which different shaped note heads were assigned to the European musical scale of fa, sol, la, and mi. 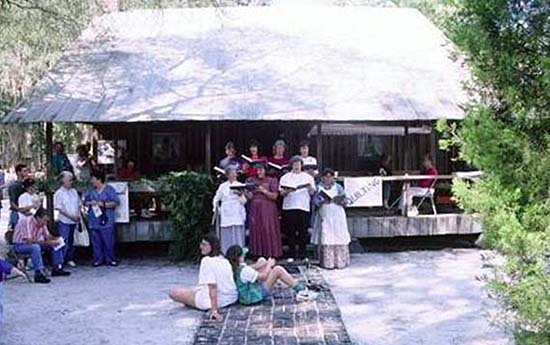 Within southeast Georgia, conservative Primitive Baptist beliefs combined with the relative cultural isolation of the Okefenokee to foster a distinctive stylistic variant of sacred harp.  Characteristics include walking time in a counterclockwise fashion according to the meter of the tune, and the same slow tempos and melodic ornamentation found in the Primitive Baptist meeting house. 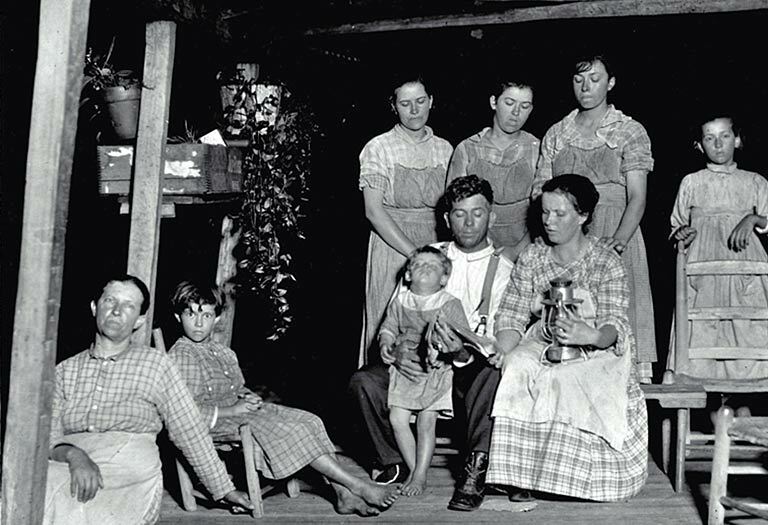 John Lee, his wife Sally Chesser Lee, and members of the Chesser family sing “Sons of Sorrow” out of The Sacred Harp, Chessers Island, July 1922. Photo by Francis Crawford, courtesy of Georgia Southern University Special Collections. Photos by Laurie Kay Sommers, 1999. 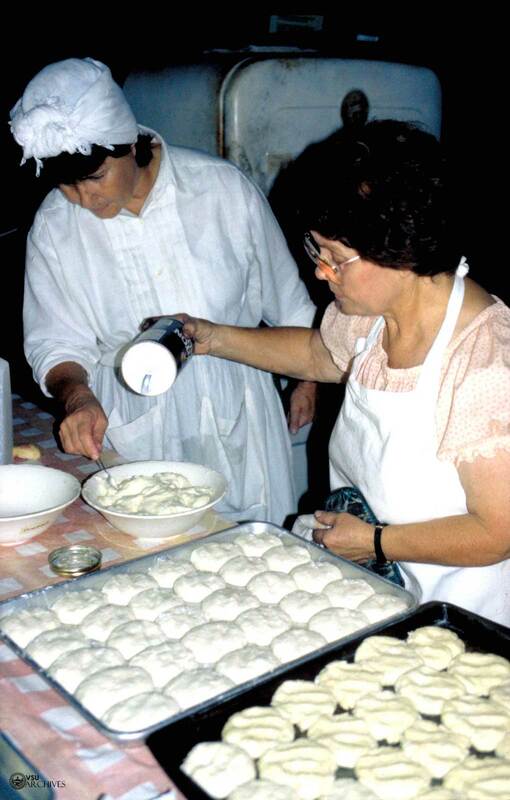 Primitive Baptist churches with their unaccompanied, lined hymn traditions, exist in much smaller number today, but they have been a major shaping force in local culture. 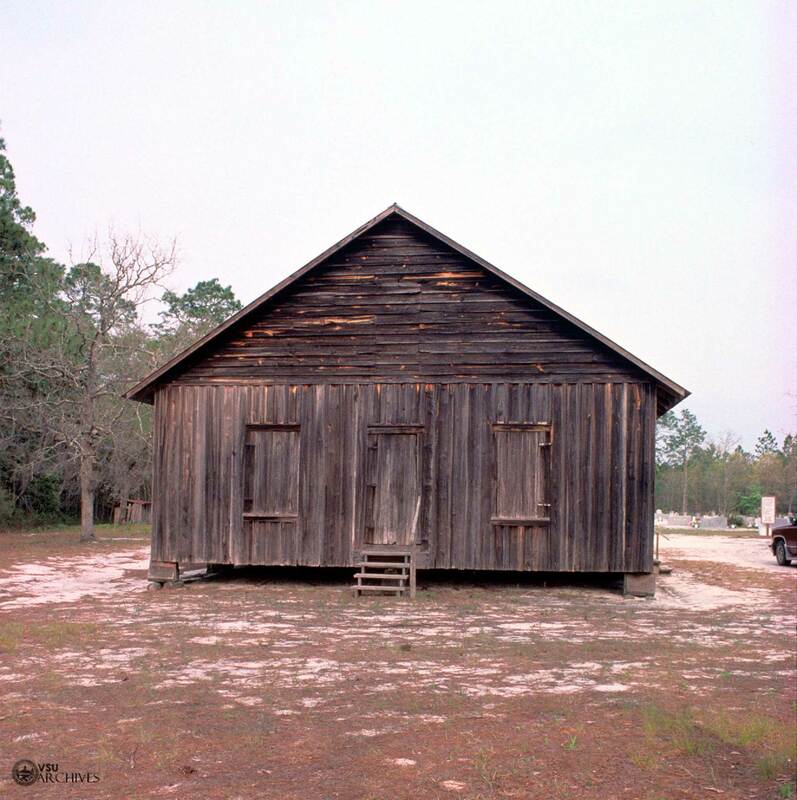 The simple wooden meeting houses of the Crawfordite sub-sect of Primitive Baptists are a distinctive feature of Okefenokee traditional architecture. 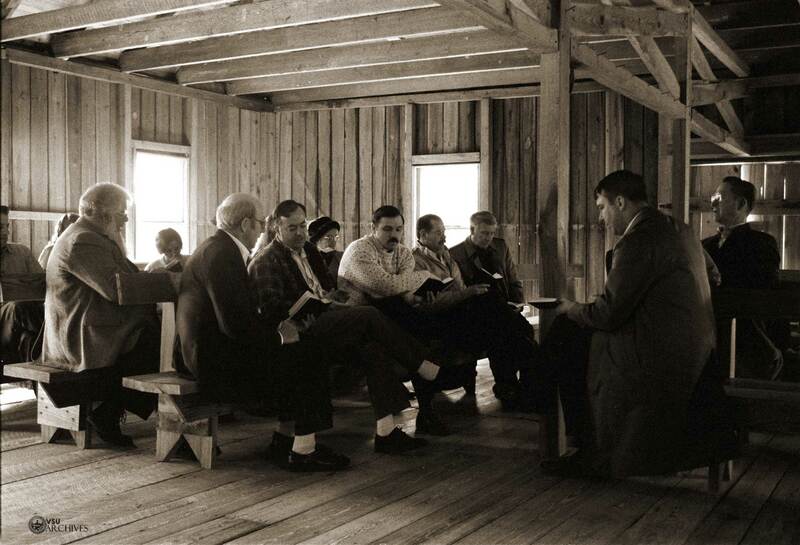 Missionary Baptist, Pentecostal, and Methodist churches now dominate the region, however, and tent meetings, revivals, and gospel sings have superseded sacred harp traditions. 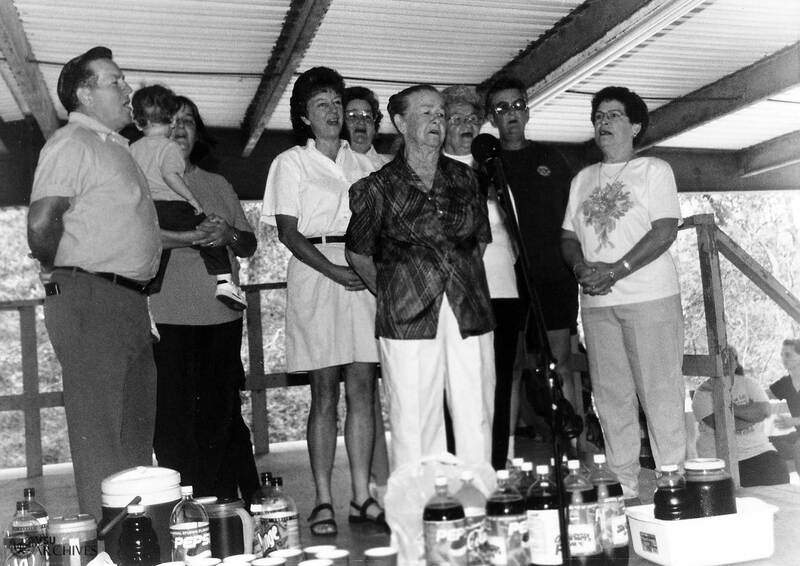 Singing from Benjamin Lloyd's Primitive Hymns at Sardis Primitive Baptist Church, Folkston, 1997. Collector Francis Harper documented swamper secular music such as locally composed songs and variants of widely disseminated ballads such as "Barbara Allen" and "The Little Mohee" (or "Lassie Mohee"), a few of which are still sung. Harper also documented hollering or yodeling: a distinctive alternation of head and chest tones, sometimes interspersed with song fragments, which was used to call hogs and cattle, to signal that an individual was returning home, or simply for the sheer joy of it. This tradition is no longer widespread, although a few families maintain the practice. 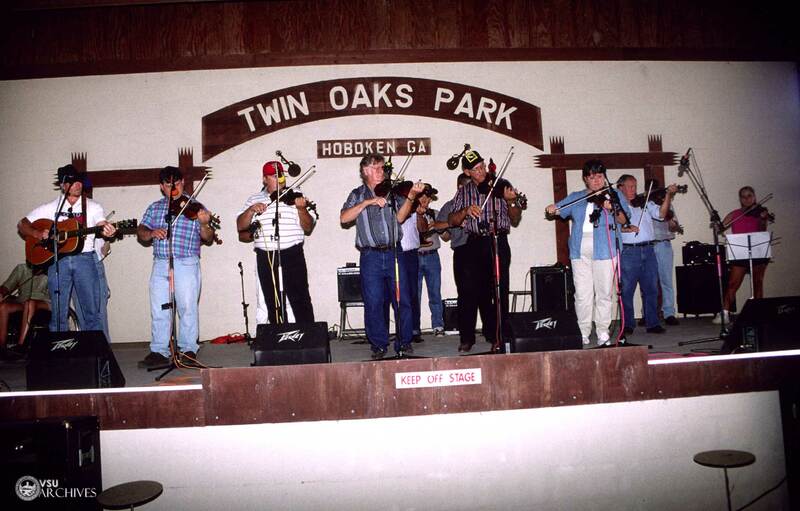 Old-time frolics and square dances have largely been replaced by country western and bluegrass bands. 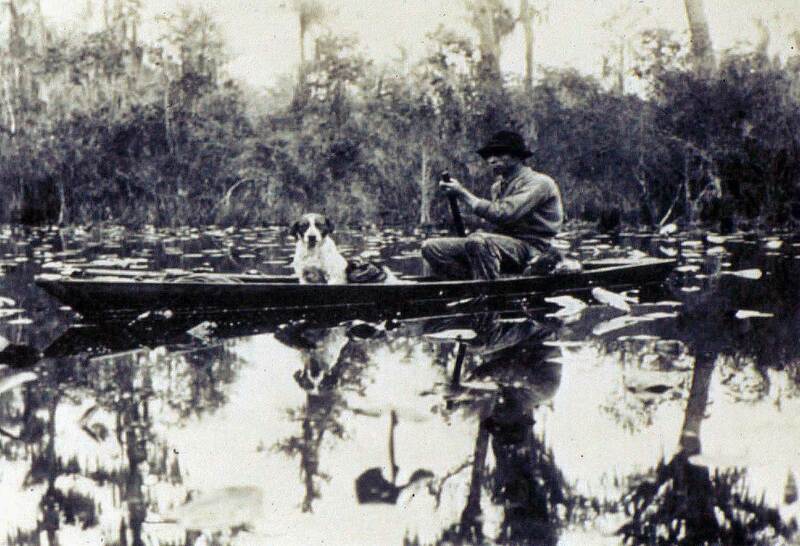 Hamp Mizell demonstrates his two-mile swamp holler, early 20th century, Okefenokee. Photo by Francis Harper courtesy Delma Presley. Cothran, Kay L.Lem Griffis: Okefenokee Swamp Yarns, in Storytellers, Folktales and Legends from the South, John A Burrison, ed. Athens and London: University of Georgia Press, 1991. Harper, Francis and Delma E. Presley. Okefinokee Album. Athens and London: University of Georgia Press, 1981. Kay, Jon and Phyllis Free, producers. Zelton Conner, An Okefenokee Swamp Storyteller (audio cassette with notes), 1999. Available Stephen Foster State Folk Cultural Center Craft Shop, White Springs, Florida. Sommers, Laurie Kay. 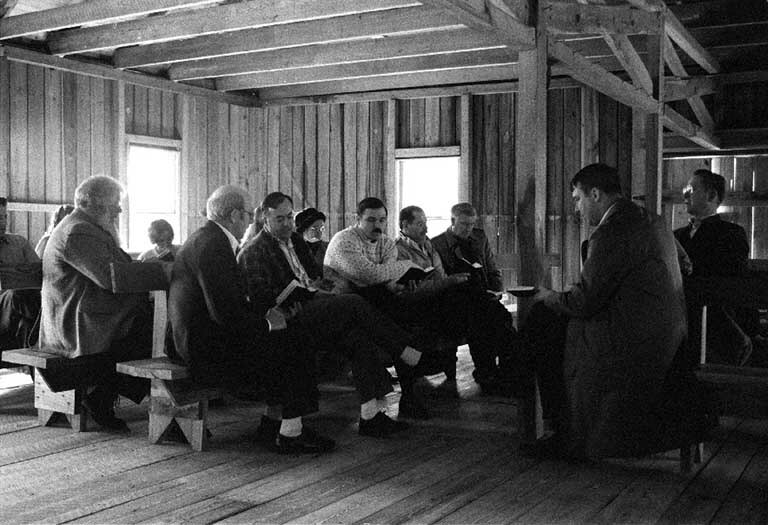 Continuity and Change in Southeast Georgia Sacred Harp. Society for American Music Bulletin, September, 2000. Fiddling students of Hubert Cox perform at the Twin Oaks Park Bluegrass Festival, held on the farm of Ira "Whit" Crews, in whose bluegrass band Cox plays. Photo by Laurie Kay Sommers, 1999.